Welcome back to the tips and tricks self-editing series! 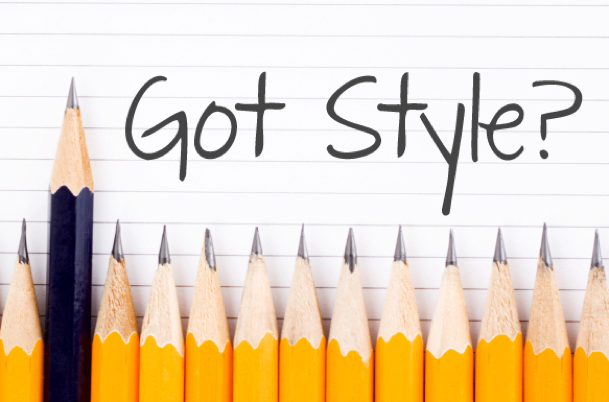 We’ve already talked about content and organization, so today we’re going to explore style. Style refers to the way a writer uses words and makes sentences—in essence, what makes each writer unique. Every time you get comments back on an assignment that says “wordy” or “awkward” or “tighten your prose,” your instructor is focused on style. Style encompasses diction, syntax, and voice primarily with different sub-topics in each, and it heavily affects the clarity of your writing—which in turn affects what the reader will understand. Even if your content and organization are great, poor style can jeopardize your writing. Beyond clarity, style affects how much your reader will enjoy your writing. “Enjoy my writing?” you wonder? Yes! Writing is supposed to be an enjoyable experience, even in an essay for school. After all, if you want to read good writing, doesn’t everyone else? Underline what’s most important in a sentence. One style issue we all struggle with, myself included, is wordiness. How can you avoid being wordy? One tip: go sentence by sentence and underline the most important parts only, then see what’s left. If large sections of your sentences are not underlined, state your point with fewer words—but be careful! You need to retain the full meaning of a sentence, so only eliminate unnecessary phrases. The fewer words a sentence has while maintaining its meaning, the stronger the sentence often is. One problem people have is beginning each sentence the same way far too frequently, especially in an essay. You can combat this issue by highlighting every sentence opener in a paragraph to see what’s happening. If every sentence begins with “The boy is..,” for example, consider adding some variety. When you want to check for sentence variety, pacing, formality, etc., it’s best to read your paper out loud. Language is, first and foremost, an oral tradition, which means we can hear it easier than we can see it. Reading your paper out loud will tell you when your writing is awkward, complicated, or wordy. Below is the style checklist. Be sure to click on the links to our separate Writing Center handouts if you don’t know some of the concepts. 󠄀 Do I avoid redundancy or repetition? 󠄀 Do I avoid expletives? 󠄀 Do I avoid passive voice? 󠄀 Do I avoid nominalization? 󠄀 Do I avoid abstractions? 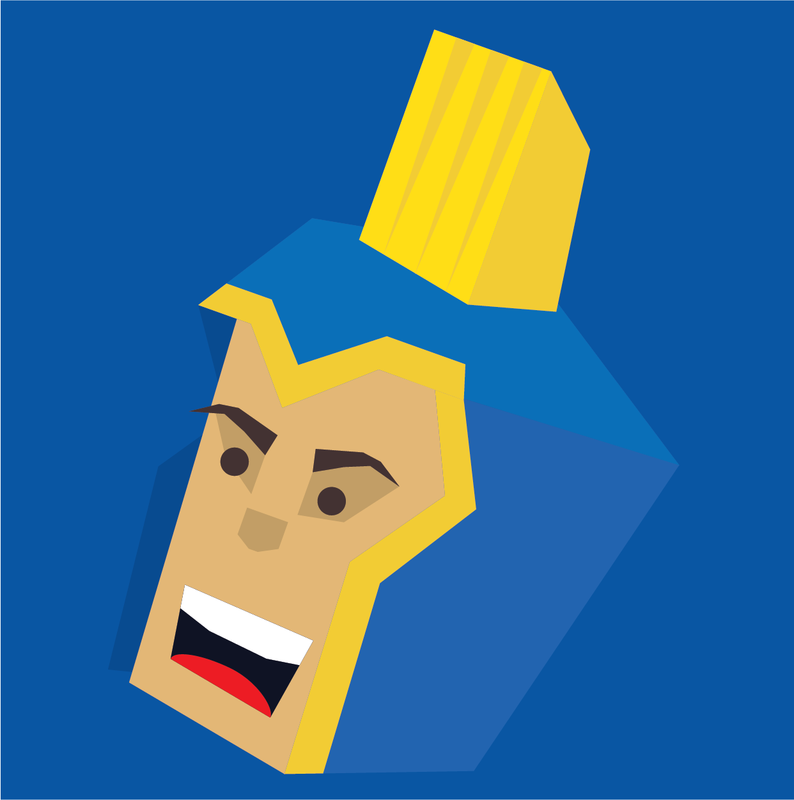 󠄀 Do I avoid meta-discourse? 󠄀 Do I write in the affirmative? 󠄀 Do my sentences have people performing actions? 󠄀 Do I use strong verbs? 󠄀 Do I present old information before new information? 󠄀 Do I have sentence variety? 󠄀 Are my lists paralleled consistently? 󠄀 Are my quotes embedded in my prose? 󠄀 Are my paragraphs cohesive? 󠄀 Are the words I’ve chosen accurate to my meaning? You’ll notice I’m recommending you avoid many things. These items all can contribute to wordiness. Now, we understand that you have word counts to meet, and we understand it sometimes seems impossible to write all 2000 words; however, wordiness inhibits clarity. 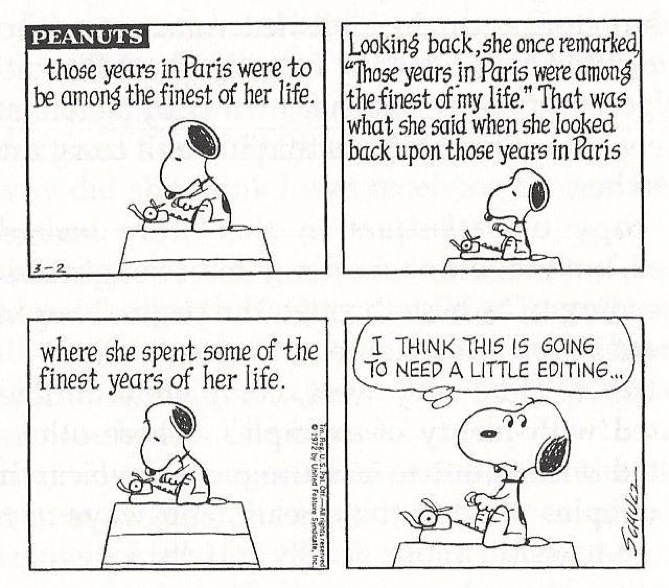 In the first example, Snoopy repeats himself in four different ways, which he acknowledges needs editing. Every sentence should offer new information to the reader. Now, sometimes we have to repeat words, especially if the assignment is on something specific like “Imagery in The Wasteland.” In this paper, I’d probably say “image” (or the specific images) often, but as long as every sentence offers something new, it’s okay. Meanwhile, the second comic doesn’t repeat itself, but it adds all these adjectives that are meaningless or confusing on their own. Only add words that are necessary for your readers to understand your point. That means you have to eliminate unnecessary words, phrases, modifiers, and so on. The ball was thrown to me by Jim. Jim performed the throwing of the ball to me. Jim is the one who threw the ball to me. Jim threw the ball to me. Jim tossed me the ball. Jim hurled the ball at me. Now we know also know how hard Jim threw the ball. The verbs tossed and hurled give the reader a better image of what happened, and the sentence is stronger. My cat looked at me. My cat rolled over. My cat fell off the chair. My cat ran out of the room. My cat looked at me, rolled over, fell off the chair, then bolted out of the room. My cat eyed my outstretched hand through his yellow orbs, considering the options. When he finally made up his mind, he rolled over then fell off the chair clumsily. Dazed, he shook himself before bolting out of the room. The first passage is choppy and repetitive. The second is quick, mimicking the quickness of the cat’s actions while the third is slower, more detailed. Varying your sentence length, type, and pacing as well as how you start and end a sentence all contributes to how engaging and clear your writing is. Whew! That’s all for today. So: take some time to think about your style on your next assignment and keep a look out for our final post in the series on grammar. “Style.” The Writing Center UNC. The Writer Center UNC, 2012. Web. 24 April 2016. Quick Tip #5: Expanding your Repertoire, Range, Variety…etc.